Body length 6.9-8.2 mm. Body width 3.6-4.0 mm. Head basic color black. Antennae filiform, bi- or tricolored, antennomeres 1-3 yellow, upper sides darkened, antennomeres 4-8 and 11 brussels brown, antennomeres 9-10 sulphur yellow. Maxillary palpi and labrum black or amber brown, penultimate joint of maxillary palpi strongly incrassate. Pronotum yellow or light cadmium, transverse, nonfoveate, not shagreened. Scutellum black or amber brown. Elytra yellow or rufous, maculate with three sharp-edged yellow ocher macula on each elytron, sometimes divided into two parts. Elytral epipleura completely yellow, sutural angle of elytra obtuse-angled, punctation dense, coarse. Abdomen yellow or yellow ocher. Tarsi black, piceous or chestnut. Tibiae black, piceous or bicolored, yellow, outer edge with piceous or testaceous line, or extensively darkened. Femora yellow or yellow ocher. This species has long been considered part of the melanocephala complex (Bechyné 1955b, Smith and Lawrence 1967) and cited as synonym of D. sinuata (Olivier) (Wilcox 1972). 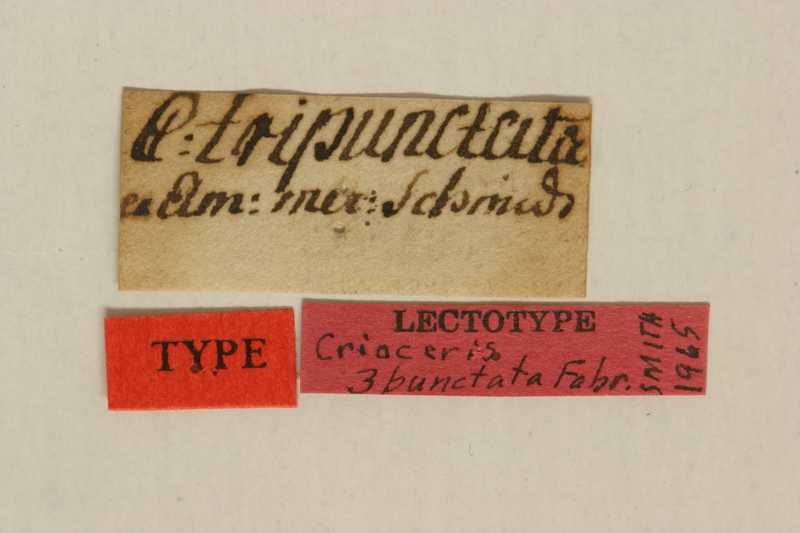 We studied the type of D. tripunctata (Fabricius) in ZMUC. The type is a female but all external features allowing for distinguishing two species easily: penultimate joint of maxillary palpi slightly incrassate in D. tripunctata, not incrassate in D. sinuata; elytra are longer and narrower (widest behind the elytron midpoint) in D. tripunctata, shorter and more rounded (widest at the elytron middle) in D. sinuata; pronotum is slightly flattened in D. tripunctata, but convex in D. sinuata; punctation is very coarse and deep, points around scutellum are connected in rough wrinkles in D. tripunctata, but surface of elytra and pronotum very shining usually in D. sinuata; D. tripunctata is larger on average than D. sinuata. 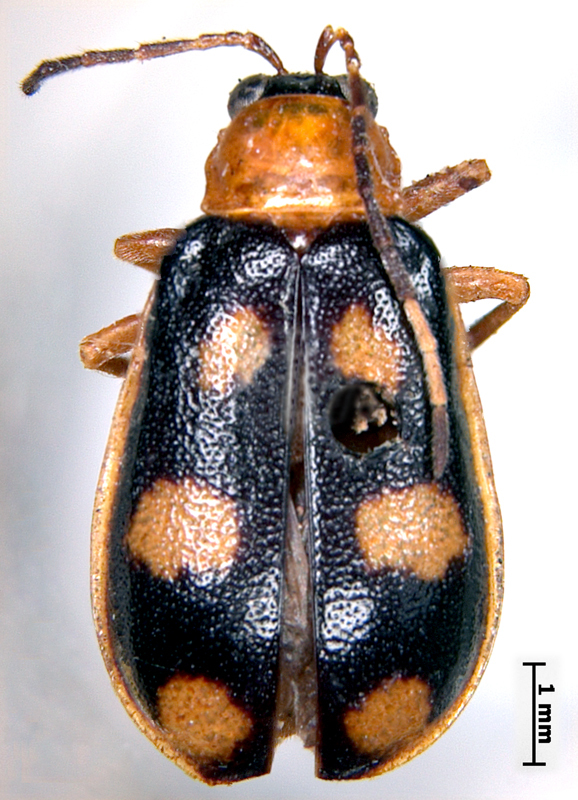 Because D. tripunctata was cited as synonym D. sinuata for a long time and D. tripunctata is very similar to D. lacordairei Kirsch (both species, D. sinuata and D. lacordairei, are common in the Central America), we included D. tripunctata in the key. Diabrotica tripunctata (Fabricius) is similar to D. lacordairei Kirsch and to a few South American species (D. consentanea Baly, D. alboplagiata Jacoby, D. javeti Baly, D. pascoei Baly). 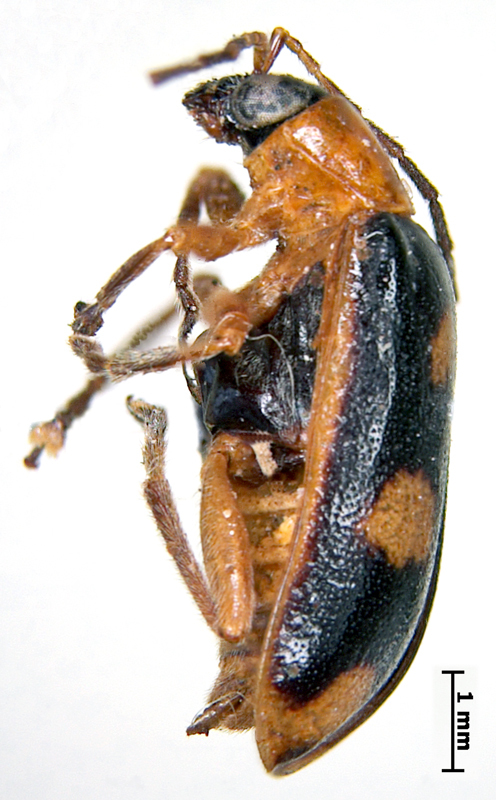 Diabrotica tripunctata can be separated from D. lacordairei by the following features: femora bicolored in D. tripunctata, but completely yellow in D. lacordairei; penultimate joint of maxillary palpi strongly incrassate in D. tripunctata, but not incrassate in D. lacordairei; elytra margin is yellow in D. tripunctata, but black in D. lacordairei.